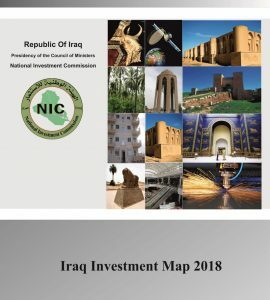 Listed below are the most frequently asked questions about investing in Iraq. Click on any of the questions to display the associated answer. If you have further questions feel free to contact us. 1. How can the NIC help me? The National Investment Commission (NIC) can assist investors by simplifying and guiding investors through the investment process. The NIC can also grant an investment license which provides significant incentives for qualifying investors. The One Stop Shop (OSS) is the NIC's single point of contact for investors and aims to facilitate this process by providing investors with streamlined and hassle-free licensing and investment services. 2. How do I apply for an investment license? What are the steps involved in applying? The National Investment Commission (NIC) has established the One Stop Shop (OSS) to serve as the single point of contact for investors. The OSS will help guide investors through the investment licensing process. Submitting an Investment License Application through filling out the application on the website. Submitting the economic feasibility study approved by a certified consultative center. Submitting the project's financing plan supported by a guarantee from a certified finical institution. Submitting brief of similar projects executed by the company. (if available). 3. What are the incentives granted to investors when they apply for and receive and investment license? 4. What is the difference between and investment license and business registration? Business registration and investment licensing are quite different. Business registration is required for a company, domestic or foreign, to do business in Iraq. Business registration is performed by the Ministry of Trade and varies on the nature of work a company will perform. Investment licensing is required for an investor to receive incentives for an individual investment project. Investment licensing is managed by the One Stop Shop at the National Investment Commission (NIC). For more information please visit the Investor Guide page or contact us. 5. What is required to register to do business in Iraq? Trade Representation Offices - Trade Representation offices cannot engage in any formal business activities. This is the simplest form of registration for a foreign company. A Trade Representation office is established only to perform business development activities, showcase products, make contacts, or perform due diligence. Branch Offices - Branch offices can be established for foreign companies who intend to work only on government contracts. Under this form, a company operates under its existing name and home country laws. Branch Offices cannot engage in non-government related commercial business activities. Domestic Companies - The term ""Domestic"" refers to companies registered under the laws of Iraq. There are many different forms that domestic companies can take including Joint Stock Companies, Sole Proprietorships, Joint Liability Companies, Simple Companies, and Limited Liability Companies. The company registration process is managed by the Ministry of Trade - Office of Company Registration (OCR). The process of registering a trade representation or foreign branch is relatively simple and requires filing an application with OCR. Domestic Company registration first requires name registration and drafting of articles of association. Name registration is managed by the Chamber of Commerce. 6. How much does it cost to apply for an investment license? There is no application fee for an investment license, however, other licenses or registrations obtained by the One Stop Shop (OSS) on behalf of investors may involve fees. These fees will vary for each request made and are based on the nature of the investment license. 7. Can the National Investment Commission (NIC) help me find a provider of services including legal, logistics, etc? The NIC can help investors connect with local service providers. To make a request, please contact us. 8. Where should I stay when visiting Baghdad? There are several lodging options for investors visiting Baghdad, for more information on hotel options, please visit the Visiting Iraq page. 9. How do I travel to Iraq? Where are the international airports located? Several airlines serve Iraq's international airports in Baghdad, Mosul, Basra, and Erbil. For more information on traveling to Iraq, please visit the Visiting Iraq page. 10. 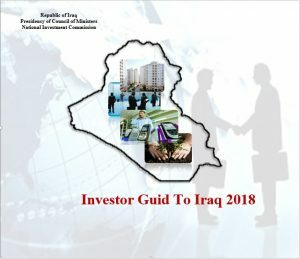 Do you recommend that investors partner with local Iraqi companies? Local partnerships are a great way for international investors to quickly enter the Iraqi economy. The National Investment Commission (NIC) recommends that interested investors explore the potential of teaming with a local partner. For more information, lease visit the Local Partnerships page. 11. Where can I find economic, demographic, and market data and statistics? 12. What is the current income tax rate? Investors awarded with an investment license receive a 10 year exemption from taxes. Even after the generous tax-free period has been completed, investors will continue to benefit from Iraq's company tax rate of only 15%, one of the most competitive in the region and globally. The flat tax of 15% is placed on income earned by Iraqi and foreign companies. Income derived from foreign government sources, international organizations, and non-governmental organizations (NGOs) is not taxable. 13. Is there a way to find all the contact information of the Ministries and identify tenders? Ministry websites can be found at the Important Links page. For additional contacts please contact us.